Christmas party season is on its way, the weather’s freezing cold, and Arsenal v Manchester United is on the telly. It’s a no-brainer to stay in and watch this weekend’s big game with a takeaway on Saturday night, isn’t it? 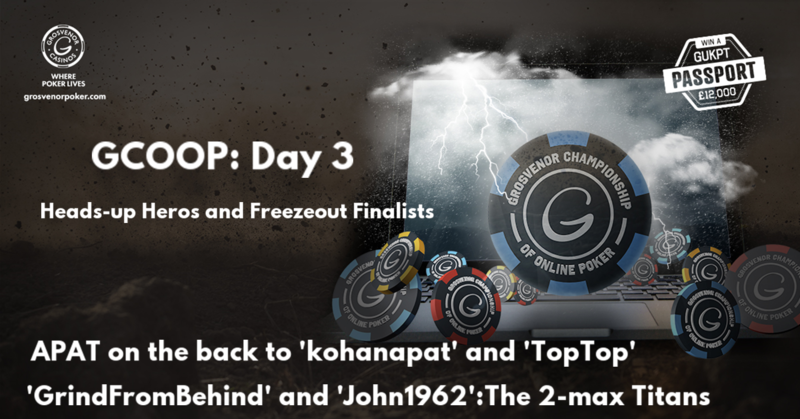 Day 3 of the Grosvenor Championship of Online Poker saw packed schedule of 4 simultaneous events. Players gunning for the £12,000 GUKPT Passport, that will grant them entry into every 2018 GUKPT main event, will have found themselves multi-tabling 2 heads-up tournaments and 2 APAT freezeouts – no small feat. It was another BIG night of online poker as all but one of the guarantees were smashed and the players and pros alike went toe-to-toe on the virtual felt for juicy paydays, leaderboard points and, of course, bragging rights. GCOOP day 2 wasted no time in picking up exactly where day 1 left off. Within 15 minutes the Hi had hit guarantee, and by the time late registration closed on both events the guarantees had been doubled! The 6-Max variant makes for a fast and ferocious game and that’s exactly what we saw last night as the action unfolded. There are some cracking jumps in action this weekend, including the Grade 1 Fighting Fifth Hurdle at Newcastle and the Ladbrokes Trophy at Newbury (formerly known as the Hennessy Gold Cup).